I don't know why exactly, but barbeque seems kind of rural to me. As does off-the-beaten path barbeque restaurants. Especially when they're spelled Bar-B-Que versus BBQ or barbeque. Anyhow, last week, when we were staying in Williamsburg, it seemed like we just had to take a drive down a few backroads to eat at Pierce's. How could we not, with that name? I wanted to buy Pierce a t-shirt, but the smallest size they had wouldn't have fit him for about another 5 years. So we decided to hold off on that. Their barbecue wasn't the best I'd ever had. Barbecue is kind of relative - I think everyone likes a different style, based on individual tastes. I like NC style barbecue first, and then Texas style barbecue second. This was neither of those (at least in my book - but I'm far from being a bbq expert) as it had a very peppery taste to it. I'm not complaining - it just wasn't my favorite. Goofy kid. I told him he looked mean. At least he was having fun! Now, time for YOUR fun. It's Rural Thursday, hosted by myself and Nancy from A Rural Journal. Even if you don't live in a rural area, just blog about something that fits into the rural lifestyle. Then grab the button and add it to your blog post. Come back and add the link to your blog post to the linky. So easy! Don't forget to visit at least 5 other contributers and leave them some comment love. I think he's adorable! Hope he liked his food. What a fun trip. what a cutie! when we lived in missouri we'd drive 3 hours for kc bbq! then in georgia, we really started to like nc bbq...there is one place back home (san diego) that's so old, i remember going as a kid even and it seemed old then lol...but they have the BEST bbq, brisket and the best sauce...i guess that was more texas. I love Carolina bbq too. How cool to get to eat at a restaurant with your name on it. What an adorable face!!!.... you could buy the T-shirt and make a pillow out of it for his bed. Lisa, Pierce is so darned cute!! As far as making faces go..... you just wait. My Grandkids make me so mad, everytime we try to take a picture, they make such ugly faces that I finally made them stop. All the kids seem to do it and I can't figure out what is up with that. I'm the opposite, Texas first, then NC. But it's all good. Love the "big smile". Hope he enjoyed his bbq! Love the smiling face... thanks for hosting, Lisa. The barbie cue looks mighty tasty! Your guy is sooooo cute! Mmm, BBQ! I don't think I have one particular favorite region . . . just so long as it's good! Though I do enjoy Carolina BBQ. 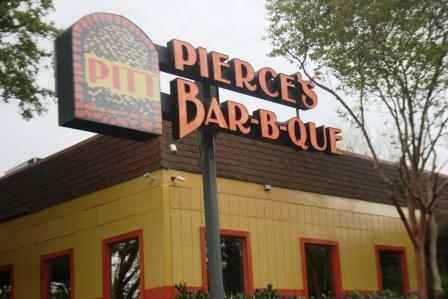 That must've been so fun for Pierce to go to "Pierce's Bar-B-Que"! Maybe the next time you're in the Williamsburg area you can get him the t-shirt. 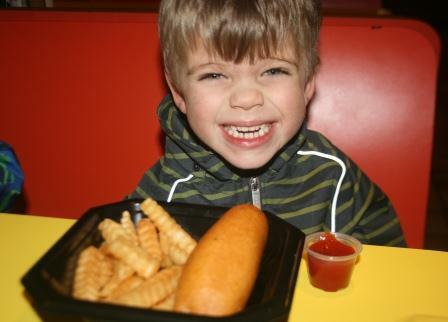 I love the picture of Pierce with his corn dog and fries!!! 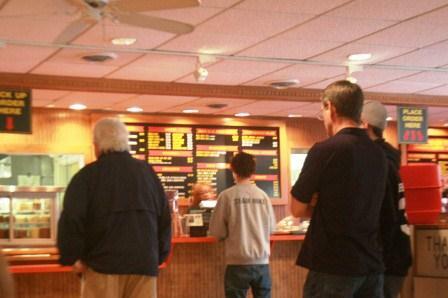 Did you meet the other Pierce, or was it just the employees there? Barbeque is a huge deal around here, I'm sure it is there, too. I have a whole post coming up about it. Wow a place for Pierce! Awww...he's a cutie! Yes, I agree...BBQ is all on individual taste. With you and Nancy both blogging about food...I'm off to make breakfast!! Thanks for visiting us at Miss Courtney Meets Bobo. I linked up with your Rural Thursday. That's so cool to find a Pierce's Bar-B-Que! Did he like seeing his name up on the sign? When I ate meat, I like NC style the best, though not if it's dry. He's so cute! NC bbq is best with Carolina BBQ sauce :) I make my own now. It's so easy and much better tasting. That's awesome! I agree, you had to go visit with a name like that. Well at least you have this memory to share with him when he is older. Maybe he will like BBQ by then! omg! your little one is sooo cute!! I'm getting kind of hungry! Dave liked that NC twangy bbq; not me, I prefer the sweet. Cute and ya shudda got the tee; he'll grow. Hi Lisa, hubby and I visited Williamburg 3 years ago. We had us some great BBQ when we were there alos. Not sure of the name. My SIL took us to their favorite place. It was yummy and we had deep fried corn on the cob. I linked up a post. After I did, I'm thinking maybe you just want rural posts. Mine may not be appropriate for your theme. Feel free to deltete it and I'll share some other time. Love that mischievous smile! I always find it amusing that you guys refer to barbecue as a type of food and we refer to it as a verb, something you cook the food with. I know exactly where that place is! :) We made our home on down in Chesapeake for thirty years. I've been craving BBQ and we just can't find something good here. Our favorite too is the NC. Pierce is a cute little guy! How cool to find a place called Pierce's Bar-B-Que! lol I would have wanted to try it to with his name on it and all. And when I think about it I don't think I know anyone named Pierce other than your son so that is fun to have found a place with his name on it. oh bbq, i love it but only certain places. we have a great bbq place five minutes from home. way too expensive but we keep going back because it is that awesome!! pierce is just soooo cute, my boys "smiled" they same way for pictures, always forced. sometimes it's just better to "shoot" them when they don't know!! What a fun grin! Looks like he enjoyed it even if it wasn't Bar-B-Que. He always looks happy! Too bad they didn't have t-shirts in his size.